Guaiacan is a fairly sparsely populated planet in the Goschvac system. It is a warm and wet world and slightly larger than most inhabited worlds of the Imperium. Vast forests of very dense hardwoods cover most of the surface that isn’t open water. The wood of these trees is sought after throughout the Imperium – both for it’s beauty and it’s strength and durability. Most of the population is involved in the forestry industry in one way or another. Guaiacan is far from the troubled spots of the Imperium and has known nothing but tranquil peace for millennia. That does not mean they are unaware of their extreme good fortune and the cost of maintaining this undisturbed existence. 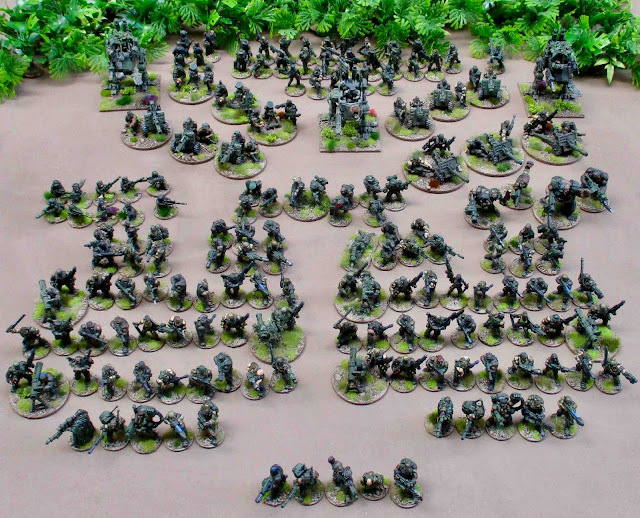 Though the total population has been maintained in the tens of millions, every generation Guaiacan tithes a regiment of 10,000 of it’s best to the Astra Militarum. The Guiacan excel at Light Infantry, Reconnaissance and Commando raiding tactics – especially in jungle or forest environments. They are capable of operating at length behind enemy lines for extended periods. Imperial commanders knowledgeable of these assets have used them to great affect in many campaigns on forest or jungle worlds to regions. Guaiacan regiments under command of those who are ignorant of their particular skill and see only their numbers have almost always met with inglorious, tragic ends, fed into the slaughter in pointless wave attacks. The Regiments are organized into 10 “Commandos” of approximately 1000 soldiers each. #1 Commando is the Headquarters and Support Commando, containing the Regiment’s command and signals, supply, and medical staff. #2-#7 Commando are the “Fighting” Commandoes that do the bulk of the work “at the sharp end”. The “Fighting” Commandos are divided into ten squadrons of approximately 100 soldiers, which are divided into Troops of varying sizes, depending on their combat roles. #8-#10 are Reserve commandos made up of the younger members of the Regiment – those recruited just before the Tithing – which will ultimately supply replacements to the Fighting Commandos as they suffer losses. The Fighitng Commandos are largely independent units with organiccombat support elements. Within the Commandos, organizations are largely administrative as the Guaiacan are always very adaptable and have a highly flexible command structure and will switch elements about depending on the nature of the operations.